As technology continues to reduce the weights of rods and reels, so the need for smaller line increases. Smaller reels like the Seigler SG or the Daiwa Saltiga can handle a lot of fish. They don’t, however, have the capacity of those larger reel spools. 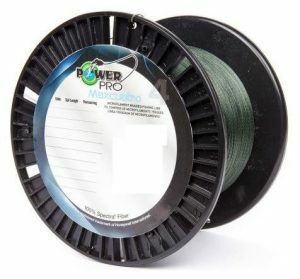 In comes Power Pro Maxcuatro braided fishing line. Power Pro set out with the goal of producing a thinner line that doesn’t lose any strength. The resulting Maxcuatro delivers, with a 25% reduction in diameter in comparison to other braided lines. 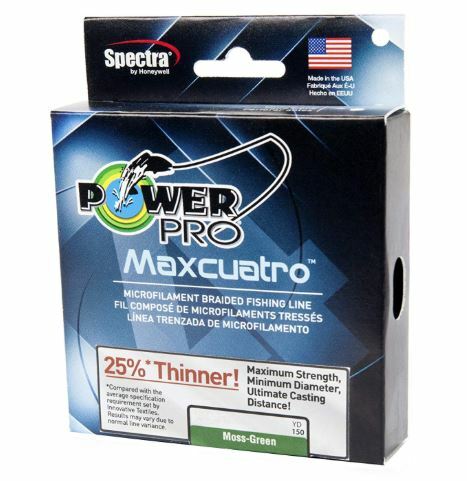 Product: Power Pro Maxcuatro braided fishing line. The secret sauce when it comes to a thinner braided line is in the fiber. and it’s Honeywell that provides the recipe. The main ingredient is Spectra HT Fiber which is 25% stronger than any previous Honeywell products. 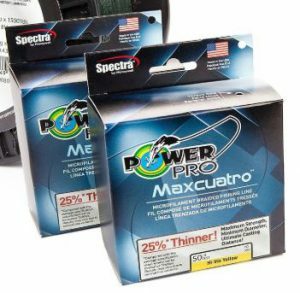 Power Pro Maxcuatro uses this Spectra HT Fiber to achieve a thinner line. In fact, Maxcuatro is 25% thinner in diameter than any other Power Pro line of the same pound test. How does a thinner braided fishing line help, you ask? Good question. A thinner braid allows you to cast farther and put more line on your reel. Honeywell also makes a good point saying it reduces visibility in the water. By all means, the biggest feature of Maxcuatro braided fishing line is its thin diameter. This wouldn’t be possible without Honeywell and their Spectra HT Fiber. Up to 30% stronger than traditional Spectra fiber, the Maxcuatro 4 strand braid drops 25% in diameter. Smaller diameter in your braided line comes with a few advantages. Better Casting Distance – As a rule, the thinner the line the farther it will cast. It has less surface area and so less air resistance. Lessen the surface area of braided line and you also reduce the friction against rod guides. More Line On Your Reel – This one is common sense. Lessen the diameter of your braided line and you’ll get more yards on the reel spool. Less Visibility In The Water – Thin line is, by nature, harder for fish to see than thicker fishing line. As powerful offshore setups shed size and weight, it helps that the line follows suit. Maxcuatro answers that need without sacrificing strength. 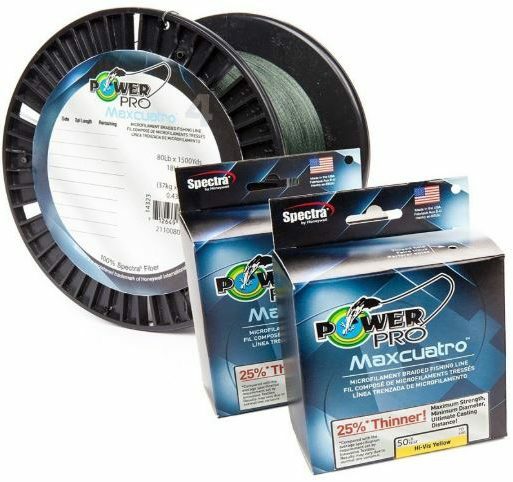 Besides the aforementioned benefits to casting, spool length, and visibility, Power Pro Maxcuatro has other advantages. With a spotlight on smaller setups, there’s no reason not to use Maxcuatro on larger size reels. Just be sure the specs match up. This will add even more precious yards to your reel as insurance against getting spooled. Finally, the reduction in line diameter also results in less water friction or drag. You won’t need as much weight on the drop to keep your intended fishing zone. There’s really no getting around it. Power Pro Maxcuatro uses a four strand braid count or four carriers as they call it. This is necessary to achieve a thinner diameter and keep line strength. It’s also probably why you don’t see tests under 20 LB or over 100. At any rate, strand count isn’t such an issue until your line is knicked. Four strands minus one will lose more integrity than eight minus one. Power Pro also spins their Maxcuatro with a gel, which helps make it softer than normal braid. This may help reduce some friction, but it makes it tougher to tie knots with and handle in general. Finally, Power Pro doesn’t come cheap and Maxcuatro runs your cost up even higher. With tests ranging between 20 and 100 pounds, Maxcuatro has its limitations in the overall world of fishing. It’s fine for fresh or saltwater, but you won’t be able to use it for light or extremely heavy fishing. Still, that leaves a large amount of room for use. Big catfish and striper come to mind in the freshwater arena. Perhaps some lunker bass. Out on the ocean, use it for any type of reel. Hook into tuna, roosters, amberjack, trevally, yellowtail, you name it. Power Pro Maxcuatro will work wonders. PowerPro.com provides all the information you need to contact customer support. This includes a phone number, address, and email. Warranties are by application only (no 3rd party sellers) which Power Pro provides on site. You may also send a direct electronic message to Shimano using the Contact Us page. Power Pro Maxcuatro fills a great need with the popularity of smaller gear. For those fishermen that don’t mind the extra cost, the line offers solid value. An overall score below 90 is mostly due to the limitations in test and color. You can’t use Maxcuatro everywhere, but it catches fish where you can. Be sure to share your thoughts, questions or experiences about Power Pro’s Maxcuatro in the comment box below. Hey Steve. My guess is that there isn’t enough demand, or the nature of the Spectra HT Fiber prevents a decent product under 20 LBS. I poked around the internet a bit but didn’t find any info about it. Give me a bit and I’ll message Shimano to see what they say.